QUEST Set To Release A Single With JOSS STONE! Quest will record a free downloadable song with Joss Stone called "So Amazing". Watch him tomorrow via live stream on MYX Soundcheck! Joss Stone "joins the Quest"! After having the rare, awesome chance to jam with Joss Stone during the Malasimbo Music & Arts Festival in Mindoro last month, Quest is now about to record a single with the British soul singer. "I opened for her in Malasimbo Music Festival... they did a documentary and she picked me to be with her. And then out of the blue they wanted to jam so I wrote a song and then we jammed. And eventually we're recording it this summer. We're releasing a collab this summer, free download! 'So Amazing' 'yung title ng kanta," said Quest during our chat with him. DANIEL PADILLA Is MYX Magazine's First Cover Artist For 2013! You asked for it, we give it to you! One of the most in demand teen artist of this generation Daniel Padilla graces the cover of MYX Magazine for 2013! He's a certified box office prince, platinum artist, heartthrob and rock star too! MYX Mag sees him in a different light as a musician! See tons of photos, a Chords and Lyrics feature plus a FREE poster! MYX Magazine will take you inside the MYX Music Awards 2013 and the Mnet Asian Music Awards in Hong Kong! We got MYXclusive interviews with Bruno Mars about his latest album, "Unorthodox Jukebox" and the "next Justin Bieber", Austin Mahone! We'll take you inside our awesome concert scoop of The Script, Demi Lovato, Dream K-Pop Fantasy Concert, 2PM and Paramore! We threw in a free Hayley Williams poster too! Get to know "Buko" hit maker, Jireh Lim in a nut shell with tidbits of fun trivia. Music lover? We'll help you understand why going to gigs is still an essential part of being a music fan. The new activity page will test your skills and music knowledge! Can you answer them all? Of course, chords and lyrics of your favorite songs are in! the FIRST to grab a copy of the issue! We'll be selling limited copies of MYX Magazine - Daniel Padilla at the Araneta Coliseum on April 30 at Daniel's first major solo concert and at the livestream viewing parties at Ayala Center Cebu and Abreeza Mall, Davao! Just look for the MYX Magazine booth at the venue and get your copies there! To those who won't be able to do so can get their copies at your favorite bookstores starting May 10. MANILA – Actress and television host Nikki Gil had her “fan girl moment” as she got the chance to meet American singer-songwriter Jason Mraz. In her Instagram account on Tuesday, Gil shared that she was able to interview Mraz for ABS-CBN’s music channel MYX. “Got to interview Jason Mraz again for @myxph SUPER nice and very generous with his answers,” she said. Coming to the set of the interview prepared, Gil said she even had her old picture with the singer signed. “I had Jason Mraz sign a photo from my first interview with him back in 2006. I think na-stress siya sa itsura ko. Hahaha,” she posted. Mraz returned to Manila on Monday for his one-night concert at the Araneta Coliseum on Tuesday. His first visit to the country was in 2011 when he staged a concert with his longtime friend, percussionist Noel “Toca” Rivera. Musician, composer, TV personality, Philippine rock icon, and coach of the hit new competition “The Voice of the Philippines” Bamboo Mañalac is adding another item to his list of roles as he takes on the challenge of being the new MYX Celebrity VJ for the month of July. Having delivered some of the most favorite tunes in the country, each of which carrying timeless impact on the face of the music scene, Bamboo is set to deliver yet another memorable performance on the Philippines’ number one music channel. Catch him as he hosts on Pinoy MYX, Rock MYX, MYX Backtrack, and My MYX this July. MYX is available 24/7 on SkyCable (channel 23) in Metro Manila and many quality cable companies all over the Philippines. MYX is also on UHF via Studio 23 during choice hours every day. For more information, log on to myxph.com. ROCKER NA SI BAMBOO MAÑALAC, MYX CELEBRITY VJ NGAYONG HULYO Ang minamahal na musikerong nasa likod ng ilan sa mga pinakasikat at pinakaimportanteng mga kanta sa bansa at isa sa mga coach ng bagong hit show na “The Voice of the Philippines” na si Bamboo Mañalac ang maghahatid ng ibang klaseng dating sa kanyang pagiging MYX Celebrity VJ sa buwan ng Hulyo. Si Bamboo ay siguradong magbibigay ng isa pang hindi makakalimutang performance sa kanyang pagho-host ng mga paboritong show ng MYX, tulad ng Pinoy MYX, Rock MYX, MYX Backtrack, at My MYX. 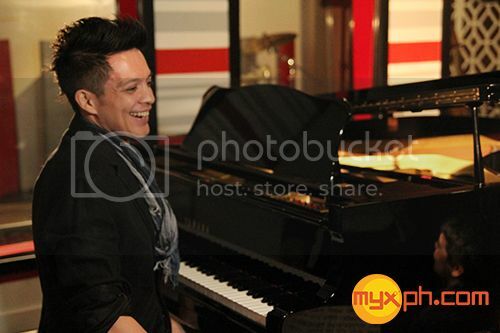 Huwag palampasin ang pagganap ni Bamboo bilang MYX Celebrity VJ na mapapanood lamang sa numero unong music channel. Ang MYX ay mapapanood sa UHF sa pamamamagitan ng Studio 23 tuwing umaga at madaling-araw at sa SkyCable, ang MYX ay napapanood ng 24-oras sa Channel 23. Para sa karagdagag impormasyon, mag-log on sa myxph.com. anyare sa myx bakit paulit ulit ang iniair na episodes? why??? In case you all still don't know, MYX Channel is now available on ABS-CBN TV Plus.